This page documents the operation of the Gracefield Industrial Line (aka Hutt Industrial Line). The Gracefield Industrial Line served the Hutt Workshops, the Gracefield Yard and various private sidings, including those at Seaview. Passenger trains ran to Hutt Park. On 30 April 2002 the Gracefield Yard was closed. Since then the branch has been a glorified siding, serving the Hutt Workshops. At 0800 hours on Friday, 24th Feb 2006, the Gracefield Industrial Line became the Gracefield Industrial Siding. 4945 propels 4104, 4409, 5097 and large headlight English Electric car D2411 from Hutt Shops to Woburn (right). November 2005. On the 26th of May 1927, following the passing of the Hutt Valley Lands Settlement Act 1925, a double track branch railway was opened from Petone to Waterloo, a distance of 2 3/4 miles. There were intermediate stations at Ava and Woburn. 64% of the cost of construction came from the sale of land. In April 1929 an industrial branch was constructed south from Woburn to serve the new Hutt Railway Workshops, the Hutt Park Racecourse and other industrial establishments. In 1943 this industrial line was extended to Gracefield, reaching its present length of 2 1/4 miles. An extensive network of sidings was constructed at Seaview when the reclamation was completed in the late 1950s/early 1960s(?). Planning included extending the branch to a deep water wharf at Point Howard. The line was electrified to Hutt Park on 14 September 1953 and to Gracefield in 1964.The wires were removed in the 1980s/1990s(?). Automatic signalling was installed in 1968 and completely removed by 1998 (although it may have been out of use earlier, after a fire at Woburn Station. The line has had at least four names - Hutt Park Line, Hutt Industrial Line (both in the 1937 WTT), Gracefield Branch (1986) and Gracefield Industrial Line (2001). Until at least the early 1960s special passenger trains ran to Hutt Park for the race meetings. There have been two stations with the name Hutt Park. The first was on the western side of the Hutt River on the Petone foreshore. It was the terminus of the foreshore line built by the Hutt Park Railway Company in 1885. The second station, which is discussed on this page, was built later. I have created a photo gallery of the line. A 1939 plan shows a proposed second branch line to a new harbour at Seaview. Over the years I have seen many trains on the Gracefield Industrial Line, including some being propelled with a shunter standing on the leading container flat. Unfortunately I did not take any train photographs until a few days before Gracefield closed. My Q2 shunt page has photographs of the shunt on Friday 26th of April 2002, two working days before Gracefield closed and Q2 ceased to operate. A few days after Gracefield closed I photographed Wellington - Napier freight 634 in the loop at Woburn. EF30013, which had been overhauled at the Hutt Workshops, was being attached to 634. Because the Gracefield Line 0km peg is about halfway along the Woburn loop (opposite the station building) 634 and a DSG shunt locomotive, which had run to Woburn attached to 634 to take some wagons back to Wellington, effectively made a crossing on the Gracefield Line. 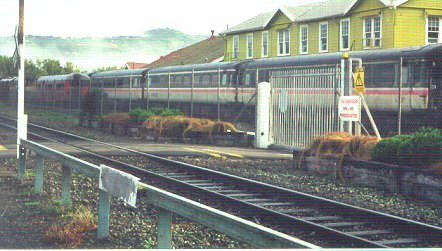 On the morning of May 5th 2004 I photographed 7241 leaving Hutt Workshops. It travelled to Woburn under its own power, from where 5154 and 4398 took it to Wellington. To view a selection of photographs of Woburn and Gracefield taken in the early 1960s go to my Graeme Bennett Photographs page. Graeme was also fortunate enough to photograph a driverless A class steam locomotive at Seaview. 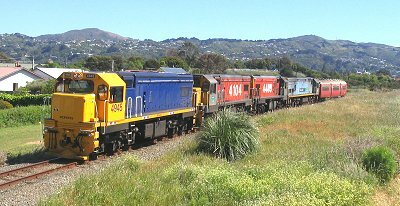 On 30th November 2005 MTT65 (Mechanical Test Train) conveyed large-headlight red English Electric car D2411, MAXX blue painted 4945 and 5097 from Hutt Shops to Wellington. At first glance it does not seem possible to install the third leg of a triangle at the junction of the Gracefield and Wairarapa Lines. However a more detailed investigation reveals some circumstantial evidence that the planners who laid out the junction area made allowance for a "third leg". Of particular interest is the configuration of the Randwick Road overbridge, which differs in one important aspet from the three other bridges that were built at the same time. My Woburn Triangle page documents my theory. An ex-NZR employee has confirmed (February 2004) that a plan of the proposed triangle once existed. I have not yet tried to locate it. The Gracefield Industrial Line was equipped with automatic signalling for some years - the signalling was removed in the 1990s. The Woburn panel was destroyed by fire in the 1990s. My Gracefield Signalling History page describes Branch signalling from 1953 to the present day. Gracefield Rail Infrastructure documents the variety of track fittings observed on the closed branch in 2003. In 1929 the line was operated under the Staff and Ticket Regulations. Train Advice 271 issued on 14 February 1929 (Chris Johnson Collection) describes the operating procedure during this period. Between Woburn and the Workshops all trains operated under the Staff & Ticket regulations Staff & Ticket also applied to Race and Picnic trains between Workshops and Hutt Park. When the specials were not running the shunter could authorise operations between Workshops and the Waiwhetu Strean under One Engine in Steam Rules. No fixed signals at Woburn on the Industrial Line for trains arriving or departing from that station. No fixed signals at Hutt Workshops or Hutt park. Porter in Charge, Woburn, must not allow more than one train to be on the Branch at a time. Notice Boards define the Workshops and Hutt Park station limits. Three types of train could run, each at specified times of the day. The trains were shunting trains, special shunting trains to the Workshops and the passenger trains. 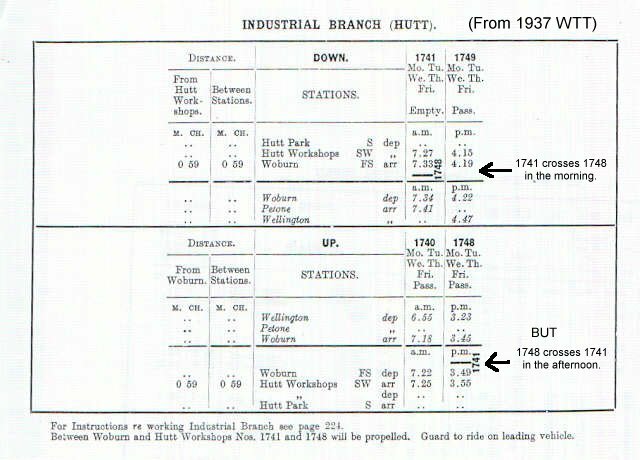 The June 1937 WTT contained the following instruction: The occasions on which staff and ticket working will be in operation between Woburn - Hutt Workshops and Hutt Park will be notified, as required, by Train Advice. Similar practices applied in 1947, including the instruction about staff and ticket working. On 9 July 1956 Staff and Ticket working was removed from the 1943 Rule Book. The inauguration of night trotting at Hutt Park on Feb.27 1960 saw a resumption of special trains to the event worked by EMU's. These had not been provided for race meetings here since the early 2nd World War when steam power had been used. The EMUs were worked under Open Section Rules. S amp; I 917 (May 1961) indicates that opposite the northern entrance to the Workshops was a board which read Automatic Signalling Ends. Entering Open Section. In the 1968 automatic signalling was installed. The signalling was completely removed by 1998, although it may have gone out of use earlier, following a fire at Woburn Station. In 2001 the Branch was within Woburn station limits (details below). Gracefield Yard closed in April 2002 and the Woburn - Hutt Workshops section was worked as a siding serving the Hutt Workshops. In August 2006 switchstands were brought into use at the north end of Woburn and revised operating procedures issued for the Gracefield Industrial siding. The diagram shows operations in July 2001. In 2001 the correct name of the branch is Gracefield Industrial Line. The "Hutt Workshops Stopping Place" is where the Workshops passenger trains stopped. These trains ceased running in the 1960s or 1970s. Following a fire in the Woburn station building several years ago most signals are either fixed red or blacked out. Running signals on the up and down mains operate automatically. Points 36, 39 and 41 are hand wound. The switchlocks act as mechanical locks now that fixed signals have been removed from the Branch. The switchlock nearest to Parkside Road has an electrical control to disable the alarms when the points are reversed. The Gracefield Industrial Line 0km peg is opposite the Woburn platform (beyond the right hand side of the diagram). The 242m between the two Stop Boards is an overlap. Signal 7 - Up Directing From Gracefield. Signal 69A - Shunt and Down Starting from Loop (Woburn). Signal 69C - Shunt and down starting from Sidings (Woburn). Signal 6 - Up Home from UIp Main (Woburn). In 1937 and 1947 Up was from Woburn to Gracefield. Passenger trains do not run on the Industrial Line. The Signalman Woburn controls all movements between the Stop Board leaving Gracefield and No. 7 signal Woburn. The Gracefield Rail Operator/Remote Control Operator authorises all movements within the Gracefield yard. Up trains must obtain permission to pass the All Trains Stop Board before departing Gracefield to avoid being detained with the train fouling Hutt Park Road. Down trains must obtain permission to enter the Gracefield yard before departing Woburn. This ensures that the train will not foul Hutt Park Road. The signalman must obtain permission from Train Control before hand winding 36, 39 and 41 points. A white light on a shed adjacent to the points is normally on except when an up train is at or approaching 6 Up Home from Petone. The signalman's view of up trains is restricted by a curve south of Woburn. One train may operate between Woburn and the Stop sign and another in the Gracefield yard. Only one movement at a time may operate between the Woburn Station Limits and and 69A or 69C signals at Woburn. Woburn was never the "end of the line" as were Waterloo, Naenae and Taita. Trains which appear in the WTT as Woburn trains are in fact to and from the Hutt workshops. This statement is based on the 1937 and 1947 WTTs. I have not yet examined later WTTs. See the Hutt Workshops Worker's Trains section on this page for details of Workshops passenger trains. All trains running on the Industrial Line must stop before fouling the road crossing situated at Hutt Workshops stopping place. Worker's Trains. From the 1930s until the 1960s or 1970s a passenger train ran from Wellington to the Hutt Workshops. The following information is from the 1937 and 1947 WTTs. I have not yet examined later WTTs. The basic pattern was a Wellington - Workshops - Wellington train in the morning with a similar working in the afternoon. There were differences with the morning return train from the Workshops. In 1947 the train terminated at Woburn, ran to Waterloo as a new train and then travelled to Wellington as a third train. In 1937 the train ran Workshops - Woburn - Petone. At this stage I can only speculate why in 1937 the service terminated at Petone. Was it to deliver workers to the Woollen Mill, the Freezing Works and the car factory (all long since gone)? In 1947 trains passenger trains arrived at Hutt Workshops at 7 25am and 4pm Monday to Friday. Trains departed at 7 27am and 4 13pm. Train 1741, the 7 27am from the Workshops was empty - the others carried passengers. Train 1740, which arrived at the Workshops at 7 25am, was propelled between Woburn and Hutt Workshops.1749, which departed the Workshops at 4 13pm,was propelled from Hutt Workshops to Woburn. This suggests that the locomotive was run around 1748 on arrival at Woburn, although only three minutes were allowed. The other trains were allowed one minute at Woburn. The Guard was instructed to ride on the leading vehicle and keep a sharp lookout. The workshops shunter was instructed to handsignal 1740 and 1748 past the facing points at the entrance to the Workshops. From at least 1929 until the early 1940s steam operated race and picnic trains ran to Hutt Park. From 27 February 1960 EMUs operated race trains for a few years. Information from Yahoo TRP List - message 46162. The occasions on which staff and ticket working will be in operation between Woburn-Hutt Workshops and Hutt Park will be notified, as required, by Train Advice. These occasions were races and picnics at the Hutt Park Racecourse. However, a 1929 Train Advice ( Chris Johnson Collection) indicates that at one stage Staff & Ticket working was used for all trains from Woburn to the Workshops. G Bennett photographed EMUs at Hutt Park in 1960. Staff & Ticket working had been deleted from the 1943 Rule Book in 1956 and Automatic signalling not installed until 1968, so the EMUs were operated under Open Section rules. The WTT entries for the Hutt Industrial Line contain examples of what are termed "paper" crossings. The following paragraphs were sent to me on a mailing list. All trains entering a Single Line Automatic Signalling area not controlled by Centralised Traffic Control system, or an Open Section must, must be scheduled to cross the last train off such a section at the border station irrespective of the time lapse within the same 24 hours or within three hours of the last train off such a section if midnight intervenes. There are two types of train crossings - commonly referred to in train running parlance as "physical" crossings and "paper" crossings. PAPER crossings are, in effect, technical crossings which are inserted to indicate to station staff and train crews that the arrival of one train governs the departure of another or conversely the departure of a train is governed by the arrival of another train. As the name suggests such crossings are shown on paper but the trains do not necessarily physically pass one another when running to time. During disrupted or late running, however, the paper crossing provides a safeguard because it is incumbent on station staff and train crews to ensure that all crossings are fulfilled or altered by appropriate instructions. Referring to the page from the 1937 WTT which follows note that train 1741 crosses train 1748. The converse applies - Train 1748 crosses number 1741. The problem is that 1741 runs in the morning and 1748 in the afternoon. In the 1947 WTT 1748 is shown crossing 1741 but 1741 terminates at Woburn (instead of continuing to Wellington) and no crossings are shown. 1740 does not "cross" 1749 because paper crossings do not extend from one day to the next. In 1937 Staff and Ticket working was confined to special trains to Hutt Park. Other trains were worked under Open Section rules. The phantom crossings were probably part of the Open Section procedures. Electrification of Hutt Park Branch. (Provide details, but also - I have given a specific date when the line to Hutt Park was electrified but cannot now find or remember the reference!). When did the Workshops passenger train cease? In 1937 why did the morning Workshops train terminate at Petone? WTTs in the 1950s, 1960s and 1970s. When were references to Staff & Ticket Working removed from the WTT?